Leah Hogsten | The Salt Lake Tribune Ryan Crockford of Charlotte, NC wins the Salt Lake City Marathon, Saturday April 13, 2019. Leah Hogsten | The Salt Lake Tribune Family and fans cheer on runners, skaters and cyclists at the Salt Lake City Marathon, Saturday April 13, 2019. 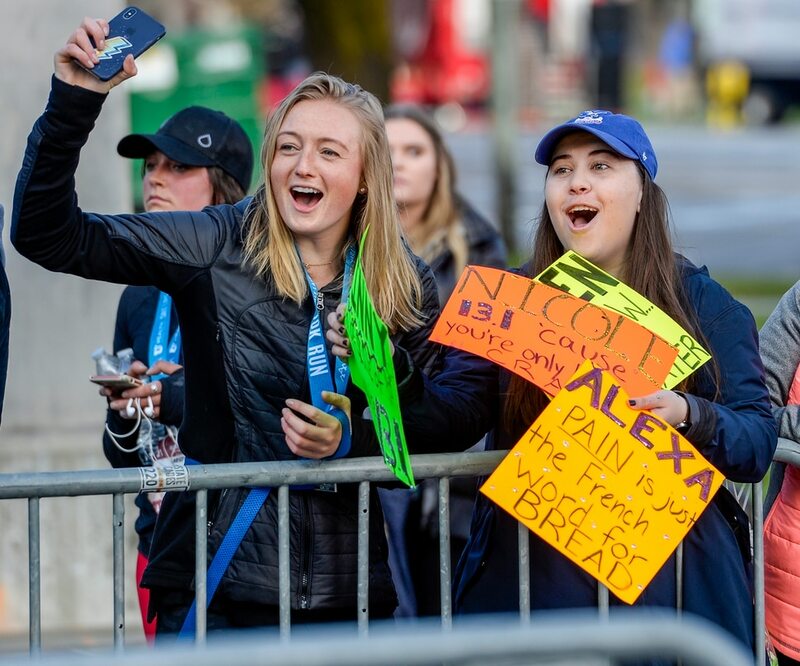 Leah Hogsten | The Salt Lake Tribune Family and fans cheer on runners, skaters and cyclists at the Salt Lake City Marathon, Saturday April 13, 2019. Leah Hogsten | The Salt Lake Tribune Ryan Crockford of Charlotte, NC wins the Salt Lake City Marathon, Saturday April 13, 2019. Leah Hogsten | The Salt Lake Tribune Janel Zick takes first place at the Salt Lake City Marathon, Saturday April 13, 2019. Leah Hogsten | The Salt Lake Tribune Janel Zick takes first place at the Salt Lake City Marathon, Saturday April 13, 2019. 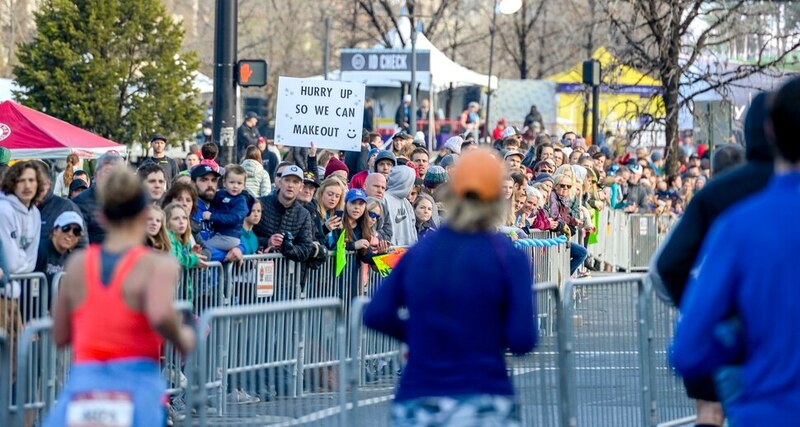 Leah Hogsten | The Salt Lake Tribune l-r Melissa Reeve, Hannah Hulme, Matt Holdaway and Joe Semus cheer on their friend Will Jibson at the Salt Lake City Marathon, Saturday April 13, 2019. Mere moments after she’d finally done it, finally won a marathon after so many tries, Janel Zick found herself seated on the cold, wet pavement on 300 East doing nothing more than trying to catch her breath. And there, all she could do is smile. She gave the spelling of her first and last name to event organizers and leaned back and looked up to the suddenly-bluebird sky and grinned a little more. Two hours and 56 minutes prior, Zick was at the start line at the Olympic Legacy Bridge, seeing flurries of snow fall from the clouds overhead. Two hours and 56 minutes later, after 26.2 grueling miles, the Salt Lake City resident could finally catch her breath knowing she was a winner. Zick won the 2019 Salt Lake City Marathon Saturday morning, her first ever win in 19 marathon tries. Saturday’s race was the 19th of her career, meaning after 497.8 competitive marathon miles, Zick burst through the ribbon at the finish line No. 1 at last. She not only won, but she blew away her time from last year, her introduction to this race. Last spring, Zick ran a 3:08:19. On Saturday morning, she topped her time from a year ago by nearly 12 minutes. Zick, originally from Akron, Ohio, relocated to Utah about a year ago and runs for the Salt Lake City Track Club. During Saturday’s marathon, she knew she had a pretty solid lead from the outset. At about mile 20, she figured that if she persevered and kept pushing, she’d get to that finish line first. Chad Crockford flew in from Charlotte, N.C., to get a taste of running at altitude. The winner of the 2016 Charlotte Marathon added to his trophy case Saturday by winning the men’s race with a 2:38:17. Crockford, along with high school pal Jason Holder, decided they wanted to come to Utah. They’re in the process of running marathons in all 50 states. The Salt Lake Marathon was state No. 10. Crockford was the first marathoner to finish Saturday, flinging his green beanie and gloves high into the air before breaking through the ribbon. Crockford grabbed a water bottle and had time to walk back to pick up his items off the ground. Ryan Richert of Chicago finished second behind Crockford with a time of 2:41:14. It was Richert’s first road marathon since 2012. In recent years he’s been running trail ultras like 50K and 50-miler races. So Saturday’s marathon was “speed work” for the runner who typically sprints on trails of dirt and dust. To prepare for the altitude, Richert knew he’d have to push himself back home. “Try to do more hills,” he said. 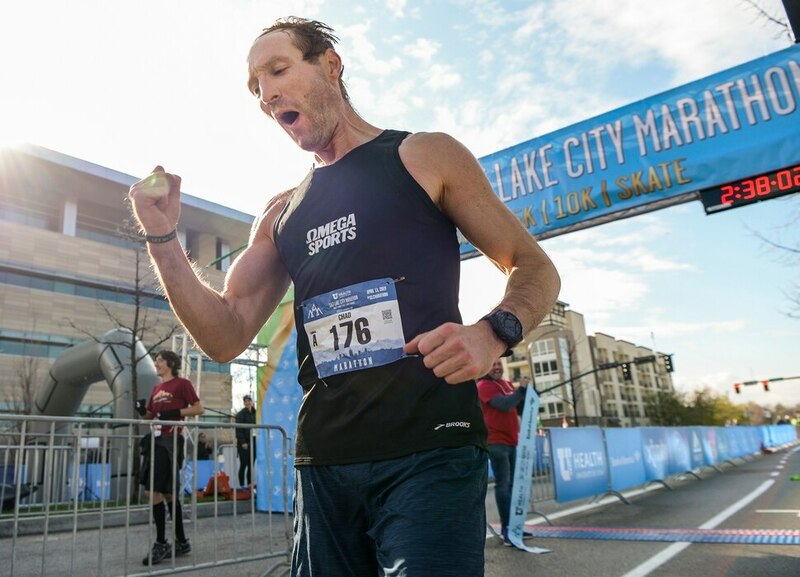 For complete Salt Lake City Marathon results, go here.